It's Great To Be Small! A beautiful story that captures the magic, excitement and wonder of the first fall of snow. "The snow is coming!" said Ma Rabbit. "What's snow?" said Fern. Everyone in the wood is getting ready for the winter but Fern has never seen snow before. Surely she and Bracken have time for one more game of hide-and-seek before the snow arrives ...don't they? 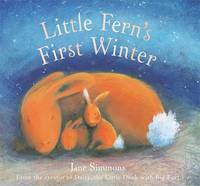 Jane has tried her hand at landscape gardening, futon making, teaching basket weaving and soft toy making but claims the only thing that has held her interest was the idea of writing and illustrating children,s books. As a mature student, Jane studied illustration under Martin Salisbury at Anglia University, Cambridge. During her course, her talent was recognised with several awards including the Association of Illustrators Images 20 Student Prize in 1995. The success of Jane's Daisy titles has been phenomenal. Her artwork is irresistible and Daisy, the little duck with big feet, is loved the world over. Jane has obviously finally found her vocation. Having travelled extensively with her family and living in a whole range of unusual homes, it is no surprise that her current home is hardly conventional. Jane, and her menagerie of rescued pets, live on an ex-fishing boat, aptly named ,Prosperity'. Along with her husband, Neil, she is currently travellling around the sunny climes of the Mediterranean. The view from the wheelhouse of ,Prosperity, is the inspiration for Jane's books and while Daisy, the little duck with big feet, gets into all sorts of trouble on the river, Ebb and Flo (two more characters created by Jane, now with their own animated television show) live on a boat very similar to Jane's and have their adventures by the sea. Jane and Neil share ,Prosperity' with Gertie and Bertie the lovebirds, a dog called Pip and Doris the cat.